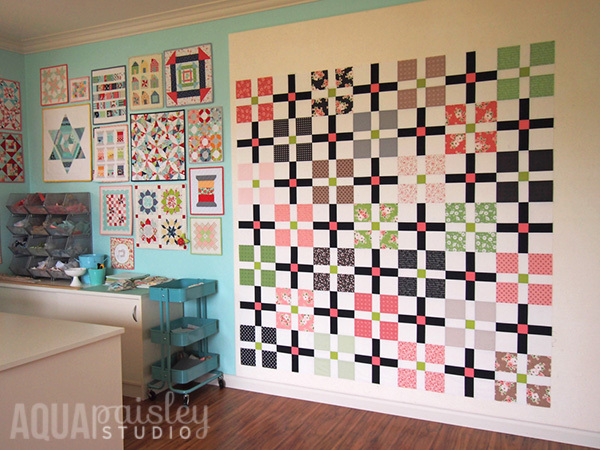 A design wall is a fabulous tool for quilters as it lets you step back from your work and view your quilt on a single plane. You can audition fabrics, or block placement, and you can get a sense of how your quilt top is taking shape as you position each block in its place. 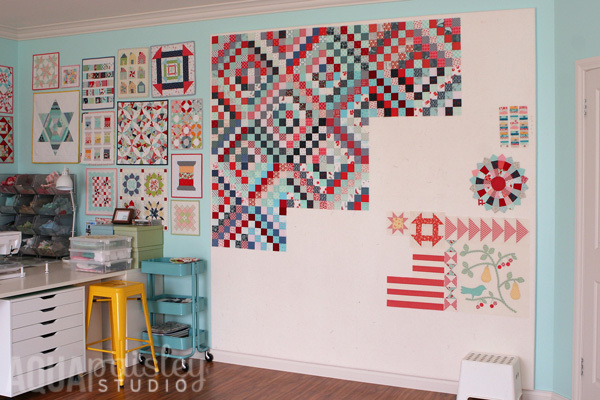 A design wall is also ideal if you want to leave your blocks out on show while you are contemplating a particular design aspect; they won’t be in anyone’s way and you can come back to them when you are ready. 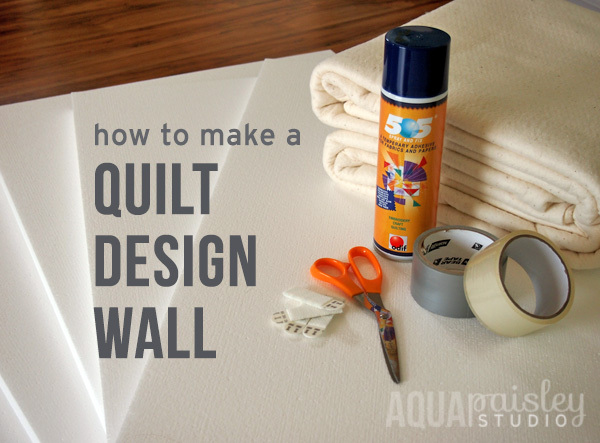 And if you have ever experienced the aches and pains sometimes associated with crawling on the floor while basting a quilt, then you might be excited to know that you can do that on a design wall too! In my first studio at the front of our house I made myself three little design boards that I hung on the small piece of wall available to me. When deciding on the best way to construct these boards my main concern was that I didn’t want to hang anything in a way that would ultimately damage my walls, so each board needed to be lightweight, easy to install and yet sturdy enough to handle regular use. My husband suggested I use polystyrene boards and pointed me in the direction of Clark Rubber . I couldn’t locate the product on their website, but I gave my local franchise a call and they did in fact have this type of board in a number of different sizes and thicknesses. The maximum width of the polystyrene boards that was available to me was 600mm, and so I opted for (3) 600 x 1200mm boards – giving me a design area of 1800 x 12oomm. Not very big, but just perfect for my little space! I chose 1-inch thick boards because I wanted to be able to stick pins into the boards, and I felt that thickness gave me the stability I was seeking. I would love to say I outgrew my little studio but the truth is I had to relocate because of my dog, Oliver! I have mentioned before that he suffers from serious anxiety, and because of that he is never far away from my side. Because the windows in this space had a clear view of the street, every time a stranger walked by Oliver would put on his best ‘tough boy’ act, bark and get quite stressed. Because I spent so much time in the studio, and he spent so much time next to me, I was getting quite stressed too -and so I relocated to the back of the house. I was able to remove these three boards without any damage to my walls as I had hoped, but since I had moved into a much bigger space, my 3 little design boards had a chance for an upgrade. 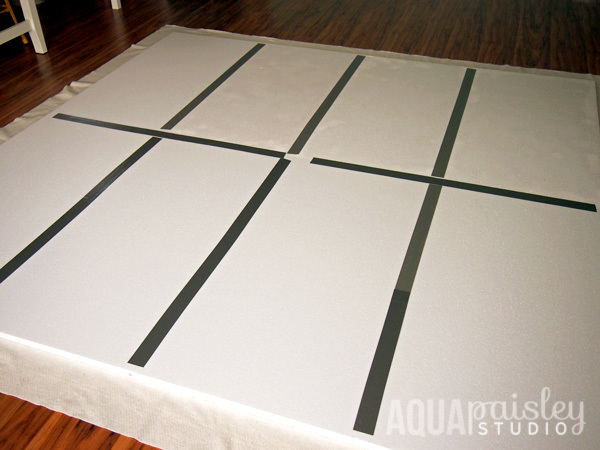 I’m sharing that little piece of my past so you can see that this technique can be used for both small and large spaces and you can wrap your boards individually like in the image above, or create one large design wall like I will show you here. And if you have a sweet, yet slightly crazy dog in your life then now you know you’re not alone – LOL! I had a quick look around the web to see if there were many tutorials out there for building your own design wall, and while there are a few, I think this method is possibly the simplest. Many of the other tutorials seem to suggest you can make your own on the ‘cheap’, I am suggesting that this method does require some financial investment depending on the size of design wall you want to create. But if you have the room for a design wall and you want to invest in something that makes life a little easier, then making your own to fit your space is definitely the way to go. It’s a simple project that you can easily construct in an afternoon, but if you are making a large design wall like mine then an extra set of hands is going to come in handy every now and then. I have broken the construction process down into 5 steps, but each step has a number of smaller steps, and not all of the steps have images – so read all the instructions thoroughly before proceeding, and if you have any questions, comment here or send me an email and I will try and help. Unless you have been able to obtain a single sheet of polystyrene (different stockists have different sizes available, and some will cut to size for you for a fee), you will need to join the pieces of polystyrene together using the electrical duct tape across all the seams. Once you have taped the back together you need to CAREFULLY flip your board to the front and repeat the process using the clear packing tape. If you are making a design wall as big as this one then this is where you will need to ask someone for help – flipping those boards at this stage is like a delicate juggling act ;). 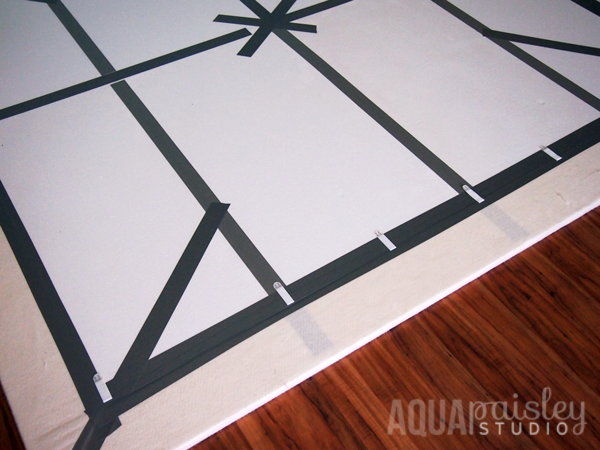 FYI – The reason you are switching to the clear tape is to ensure that the tape can’t be seen through the batting once your design wall is completed. Again, carefully lift your design wall which should feel much sturdier now that both sides have been taped together and temporarily set it aside. 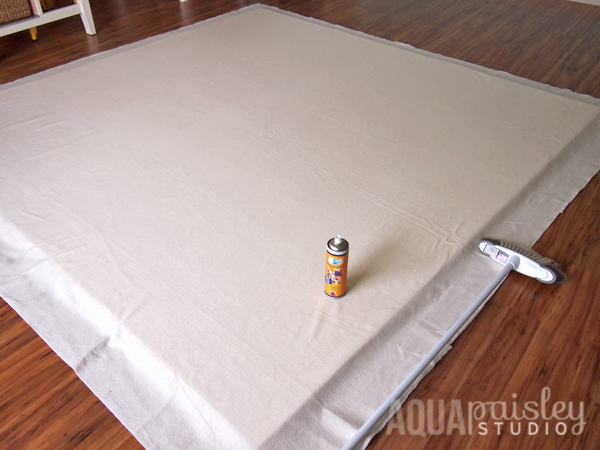 Lay a piece of cotton batting larger than your foam boards on the floor. Lay the foam boards on the centre of the batting and cut the batting so that it is approximately 4-6-inches larger than the board on each side – it needs to be able to wrap around the thickness of the board and be secured to the back side. Once again flip your design board so that the top is now facing up and place the batting on top. Fold half of the backing onto itself, right sides together. CHECK THAT THERE ARE NO STRAY PIECES OF DIRT OF DARK THREAD on the backside of the batting. Evenly spray the basting adhesive onto the back of the cotton batting. If your design wall is small then you should be able to slowly unfold the batting adhering it to one half of the wall by slowly laying the batting on top of the board, smoothing it out from the centre until you reach the end. The principle is the same for a large design wall except that this step is best undertaken with multiple hands. I had one person on either side of the wall slowly and evenly laying the batting on top, with a third person using the clean broom to reach the centre and act as another pair of hands smoothing out the batting. Does that make sense? I hope so – it was too hard to take a photo because there were only 3 of us home at the time and each of us had our hands full ;)! Repeat this procedure with the second half. Smooth out any wrinkles as best you can with your hands and the broom if necessary. Yep it’s time once again to flip your design wall – but don’t worry, by now you should be an expert flipper ;P, and it’s the last time I promise!! Once your design board is face down you can prepare the corners by cutting away some of the excess batting and creating a nicely mitered corner. Repeat for each corner. 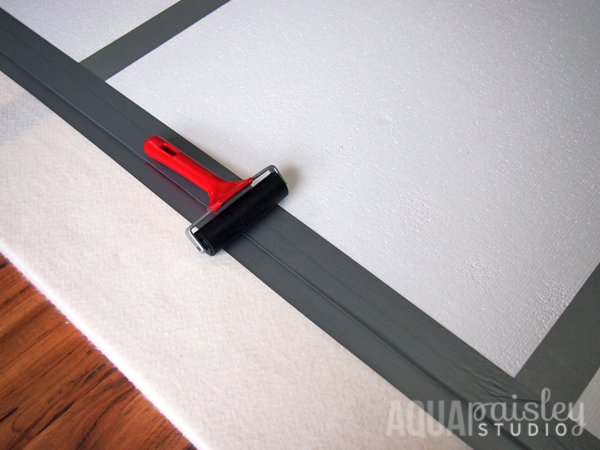 Using the electrical duct tape once again, secure the edges of the batting to the back of the board by running the tape along the edge. I also used the tape to form some diagonal cross bars for extra stability. Unfortunately due to the overall size of my design wall I wasn’t able to tape from one corner diagonally to the opposite corner without standing on the back of the boards, and I wasn’t willing to risk crushing the boards with my weight – but if you have a toddler in your life then you could hold the tape on one corner and send them across ‘slowly and gently’ to the other side ;). Because of the thickness of the batting, I used a brayer to run around the outside edge of the tape to really make sure that every inch was adhered down, but a rolling-pin or even you own hands should be able to do the job. The final step is the only really tricky part to this whole process! Using an appropriate number of 3M Adhesive Hanging Strips (in my case I used 7 across the top, 6 across the bottom and 4 across the centre – I am sure that number was overkill, but I knew that some wouldn’t necessarily align with its partner and some most likely wouldn’t work all that well because unlike a normal hard surface that you can push to secure the Velcro teeth, you can only gently push the polystyrene because it is easily indented) – adhere one side of the hanging strips to the back of the design wall, securing them on the electrical tape surface for the best adhesion. 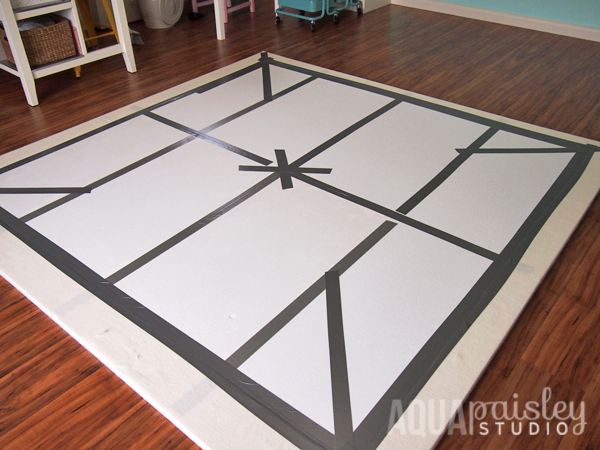 Determine the exact position of all your adhesive strips and mark the corresponding measurements on your actual wall where the design wall will hang. Follow the manufacturer’s instructions and adhere the adhesive strips partners on to the wall. 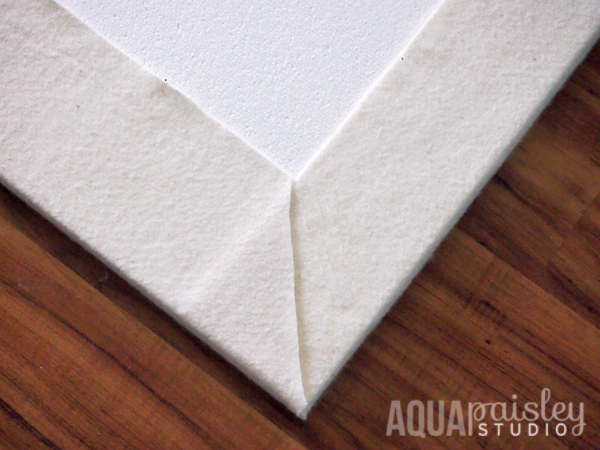 Wait the required amount of time to ensure the adhesive strips are active and secured to your wall and then lift up your design wall and doing your best to align the hanging strips, mount the design board onto the wall. As I mentioned don’t push too hard, just use gentle bursts of pressure where you believe a strip to be – if you are in the right spot you should hear the velcro connecting. And that’s it! Sit back and admire your afternoon’s accomplishment and enjoy the benefits of having your own design wall. This is what my design wall looks like today! My #scrappytripalong blocks have been on there for a few days and they will stay there unless I remove them or there is an unusually large gust of wind that blows through the studio. Every now and then a block might fall down, but it isn’t often. If I want to place a finished quilt top on the design wall the weight of it might cause it to fall down, so to counteract that problem I will place a number of pins across the top of the quilt, and between them and the static that is created between the batting and the cotton the quilt top stays where it should. I find that if I can see a project I am more likely to feel inspired to work on it, and so a design wall is a great motivational tool too. 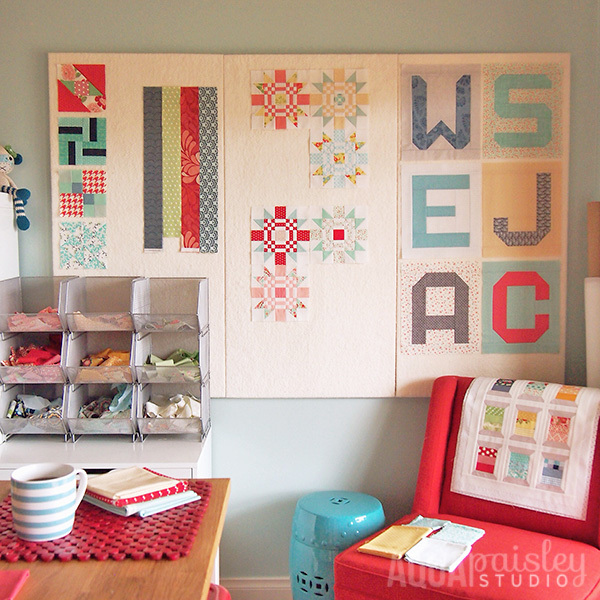 I hope you feel inspired to make your own design wall for your sewing space, no matter how big or small! Thanks for stopping by,and a big thanks to all those on IG that recently asked about my design wall and gave me the push I needed to put together this post – I hope I have answered your questions :). This is a great post Sam!! Clear, precise and easy to follow. Thanks so much for blogging about this! Thank you for blogging this for us! I sure want to add one to my new studio! Your welcome Gayle – I hope this gives you some ideas! This looks great! I think I need to rearrange my room to get one of these! thanks for your tips! Great idea! I don’t suppose your Oliver is a Jack Russell? My Oliver goes a little crazy when people walk by, is by my side constantly and a bit anxious. He is only part Jack Russell. Hi Kate – No he is a Cavoodle – but they definitely sound like they have similar personalities ;). Hi Cath, I used a cotton batting to cover the design boards and so there was no noticeable nap that I had to take into consideration. I love this idea. One thing I added to my design wall was a curtain rod above the wall. That way I can hang finished quilts or half finished quilts and get a good view of them. 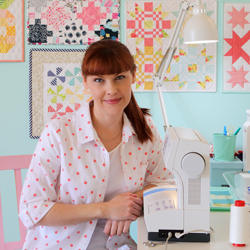 I would love to ask you if you would show a pciture of your sewing table. I see a little corner of it and love what I see! I am trying to decide on a desk! My puupy Buddy loves to spend time with me in my studio. Hugs to you and your sweet pup! Your instructions are wonderful, thanks so much for your generous sharing. My handyman husband is helping me turn my sewing room into more a quilt studio (to go with my new Bernina 770) and a design wall is something I’ve always wanted. Now I know how to have him help me create one! Love, love, love your room! So cheery! I like your scrap fabric storage bins, as well. 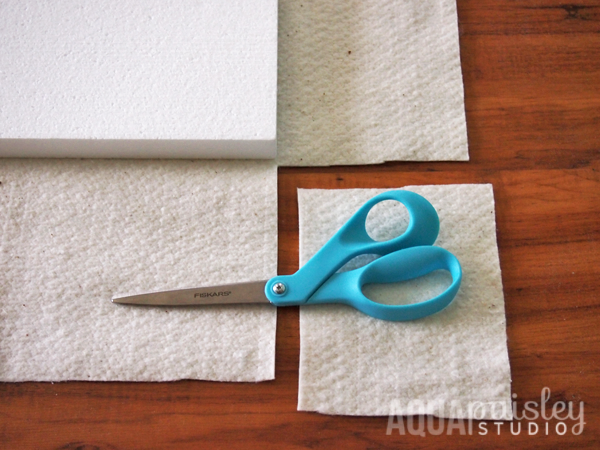 Have you written a tutorial on how you store your scraps? And where you got your stacking metal bins? I’d love to read it! Thanks Sondra! I haven’t written a post like that yet – I am still trying to find the best way to store my scraps that works for the way I tend to sew, but it is certainly a good idea for a future post. Love your site! I want to create a design wall–preferably from materials I already have on hand. I like the idea of the flannel backed table cloth tacked to the wall but have read that as you assemble the quilt you may have trouble getting the larger/heavier pieces to stick to the flannel, especially if the table cloth has been laundered many times. Have you had this problem? Would the pieces stick better to batting? I noticed you mention using cotton batting but I have a large, unopened piece of “High Loft Resin Treated Polyester Batting” that I came across in my Mom’s old sewing things that I probably will never use for anything else–would that work better than old flannel? I realize I could test this myself but I’d rather narrow done the choices before I ask my son to go rummaging around the basement! I know he’ll want to know if I’ve done all my research before he starts lugging boxes upstairs LOL. Thanks in advance for your help! Hi Christina – I don’t have experience with polyester batting or the flannel backed tablecloth so I don’t have an answer for you in that regard. I do know that the method I have shared here has worked perfectly for me and has held up well over time. Good luck experimenting to see what works best for you. Hi Dawn – As I haven’t tried it myself I wouldn’t like to surmise what screw in hooks would do to the boards. I used the 3M adhesive strips to attach mine to the wall and it has been completely content hanging on the wall for quite some time. I am sure there would be some sort of fixing suitable, but it would probably be best to ask at your local hardware store for more reliable advice. Hello, I have two screws through mine in the top corners it’s been hanging for nearly a year… if that helps?! It’s a fantastic design wall I love it and the instructions were awesome! Great instructions. There are a lot of DIY design wall ideas on the web, but I like yours the best. Now, off to the store for me. I don’t know if it would work in this instance, but whenever I hang a picture or something using the 3M Velcro Adhesive Hanging Strips, I always attach the two halves of the Velcro together first before adhering it onto the object. Then, I expose the other side (wall side) of the adhesive and hang the object on the wall. Since the Velcro halves are already connected, it saves the trouble of trying to match the two components of the Velcro while struggling to holding the cumbersome object in place. However, you still have to apply pressure for a bit while the adhesive sets.